When I turned 30, I got serious about my life goals. Not necessarily serious goals such as financial or retirement, but fun goals, some simple, some not. One of my big goals was more road trips. We've accomplished this the last couple of years with numerous road trips: day trips around Iowa, fun weekend getaways, vacations, etc. This summer we're planning a big road trip to Smoky Mountain National Park. Along the way we'll be making stops in Memphis, North Carolina, and Kentucky. I decided now was as good of a time as any to create a new goal: visit all 50 states by the time I'm 50. The goal is supported by my 3 minis, who also adore road trips and visiting new places. I've got quite a bit of "work" to do, but with our summer road trip, I'll be able to cross 3 more states off of my list. The places I've visited include places I've spent a fair amount of time in site seeing. These do not include places I've driven through or airport layovers (or I'd have added several more to the list). We'll see where future adventures take us, but I've got my list, a minivan ready to be loaded up (admittedly with more things than we really need), and 13 years to accomplish my goal. If you've got any must see and do things in the states I have yet to visit, please do share! 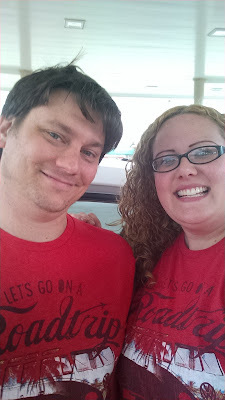 Our official Road Trip t-shirts that we wear every vacation. Yes, I am THAT person.